There are a few motorcycles out there with almost nowhere to easily mount a cell phone. No handlebar space. The fork stem is too small. The clutch mount just doesn’t fit all that well. I guess you could drill a hole somewhere but who wants to do that. For some of those difficult motorcycle models, the gas tank mount is the only way to go. So let’s take a closer look at Motorcycle Gas Tank Mounts for Phones. To start, you need a motorcycle with a big enough gas tank surface area. Something similar to what you see on the Harley Street Glide in the photo that accompanies this article. This motorcycle owner opted to mount his GPS elsewhere but I wanted to give a sense of the surface area needed to mount a device onto the gas tank. There are three types of motorcycle gas tank mounts. We’ll cover all three. The first has a bolt pattern that matches up with the has tank cover. Easy to install but sometimes a bit of a challenge to remove the gas tank cover. These are often model specific. The Krator Adjustable Tank Mount for Motorcycles bolts onto the gas tank cover. Easy enough. This particular one that we’re discussing fits Yamaha, Suzuki, Ducati and Triumph models. There’s an adjustment point right in the middle so that you can manipulate the angle and tilt. This is just a base mount meaning you need to add another part to hold whatever it is that’s being mounted. A good recommendation for a phone would be to add a RAM diamond, arm and X-Grip holder. The mounting diamond will line up with some of the screw holes on the top of the mounting base. Just add some nuts and bolts and tighten it securely. The X-Grip holder is a well made cradle that will open to 3.25 inches. Large enough for most phones but larger ones are available for real large models with thick cases and skins. Motorcycle gas tank mounts have a few different types. The next type isn’t really a mount but more of a multi-purpose case. 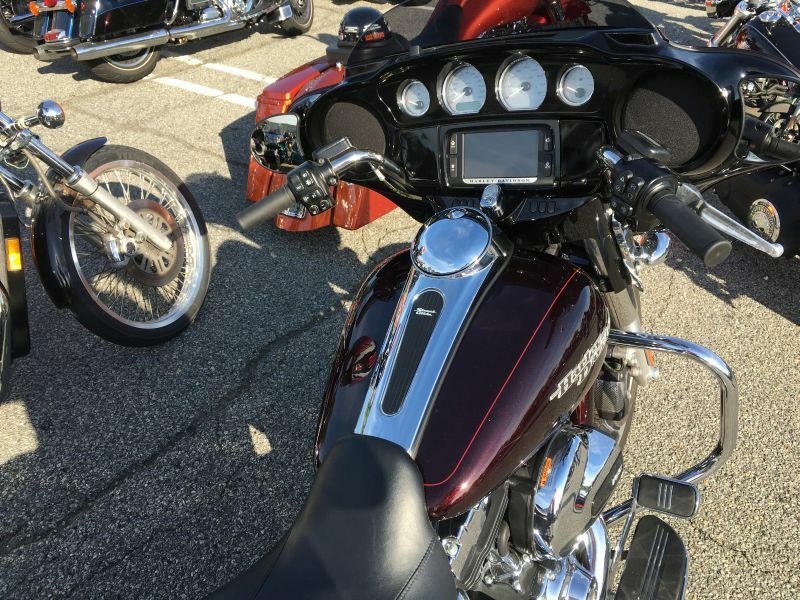 The Bikers Shield Magnetic Tank Holder for Smartphones measures 6″ x 1″ x 4″ and is held onto the gas tank with magnets. That’s the one in the photo that accompanies this article. There is a clear lens that allows you to see the phone or GPS display. These types of mounts have some pros and cons. On the positive side, it’s the easiest of almost all holders to install as it’s a series of magnets that hold the case to your gas tank. The con is that it’s a thick case so you may be challenged to interface with the touch screen while it’s in the case. The last example in the category of motorcycle gas tank mounts is the adhesive variety. The Arkon Adhesive Motorcycle Gas Tank Smartphone Mount Holder is an example of what I am referring to. This mount combines a weatherproof case with a VHB adhesive base. VHB is an acronym for Very High Bond adhesive. Now, I’m not a big fan of using adhesive on a vibrating motorcycle but if you’re going to do it be sure that the mount that you select uses VHB and follow the manufacturer directions very carefully. The surface it’s being attached to needs to be flat and clean. You must let it sit at least 24 hours before use to ensure the bond is complete. These fit devices up to 5.95” x 3.12” x .33” and comes with a 2-year warranty. Like any mount, you should setup the device prior to your ride. It’s dangerous to interface with any device while riding, so don’t do it. You may notice that I didn’t list a GPS for a gas tank mount. While technically it can be done, I don’t like the idea of taking your eyes off the road to look down at the device mounted on the gas tank. The main purpose of motorcycle gas tank mounts is to keep your device nearby, not to frequently reference it while riding.